When designing an automobile, engineers have to make compromises or tradeoffs to satisfy performance, longevity, reliability, and comfort objectives. Perhaps one of the best examples of these compromises is in suspension bushing design. A bushing is an isolator (usually rubber) that serves the purpose to both isolate noise and vibration (comfort) and allow a measure of articulation (performance). The problem with a rubber bushing is that the softness required to reduce noise, vibration, and harshness (NVH) and provide a cushy ride is the exact opposite of what is necessary for good performance. 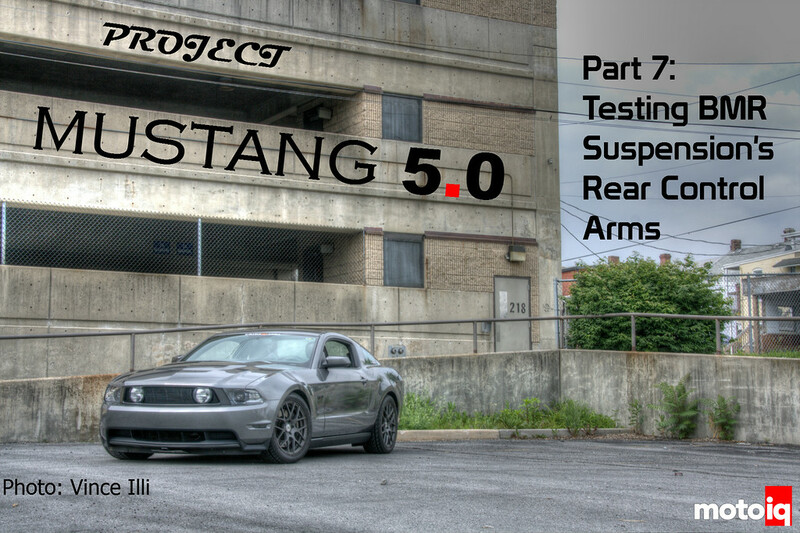 Read more about Project Mustang 5.0 here! This is the stock rubber bushing on one of Project Mustang’s stock control arms. You can see that it is made of rubber for isolation from NVH and has voids cut into it on the top and bottom to allow the control arm to articulate in those directions. The problem with a rubber bushing is that it is “squishy.”(I apologize for using such a difficult and technical word.) Squishiness is good for a comfortable ride and stuffed animals, but it’s not good for performance. Soft bushings create a feeling of slop in a suspension. This is because any forces transmitted through the bushing must first compress or stretch the bushing before they can act on the vehicle. In the case of the control arm pictured above, when the axle pushes the car forward, it must first compress that squishy bushing before it can push the control arm and then the car. As an example, imagine that you are pushing a heavy, wheeled cart. But instead of pushing on the actual cart to move it, you are pushing on a spring that is, in turn, pushing on the cart. Before the cart will move much, you must first compress the spring. Some of your effort in pushing the cart is lost in compressing that spring. The compressing of the bushing is what creates slop, because there is a short time between the driver’s inputs (such as steering and braking) and the car actually reacting to these inputs while the bushings in the suspension compress. So the solution from a straight-line standpoint would seem to be to simply eliminate the bushing and directly bolt the control arms to the car. This would allow all of the acceleration and braking forces to be transmitted directly to the chassis. However, that would create bind, because during cornering the control arm needs to articulate around those bolts. That requirement for articulation is the second reason that bushings are used. 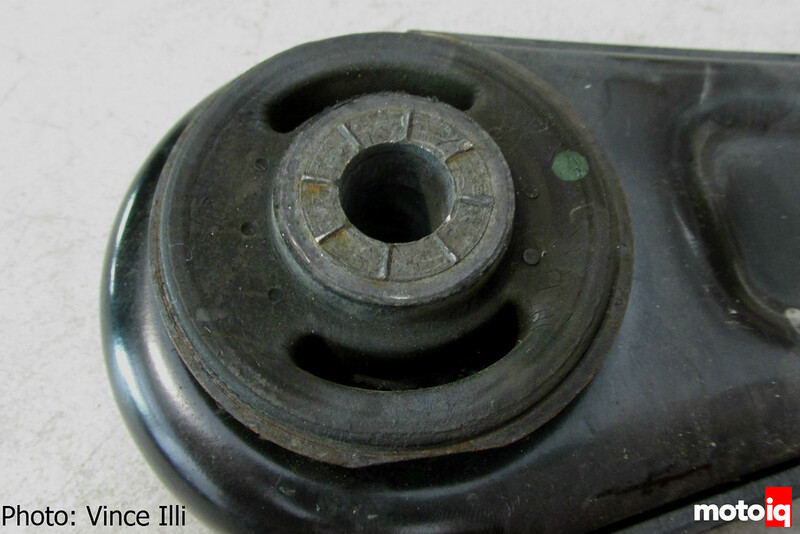 It is possible to replace rubber bushings with ones that are harder by increasing the durometer of the material. The durometer is a measurement of how difficult it is to deform a material, so the higher the number the “less squishy” it is. Polyurethane is a popular material choice for more performance-oriented bushings. It has a higher durometer than rubber but still allows some deformation and thus doesn’t completely compromise ride quality. This polyurethane bushing from BMR Suspension replaces a factory rubber bushing. 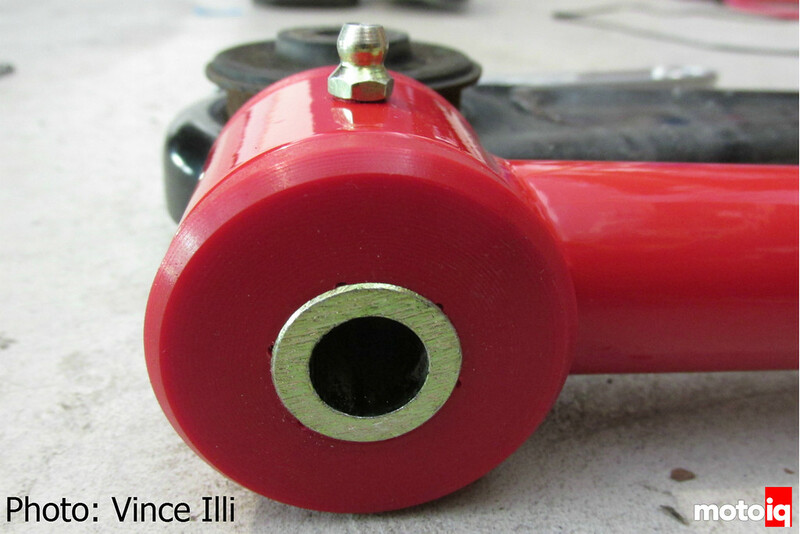 The advantage of polyurethane bushings is that it is stiffer than rubber, removing a lot of slop from the suspension. The disadvantages are increased NVH, increased maintenance requirements (polyurethane must be lubricated regularly to prevent squeaks), and less articulation if the bushing is not designed correctly. 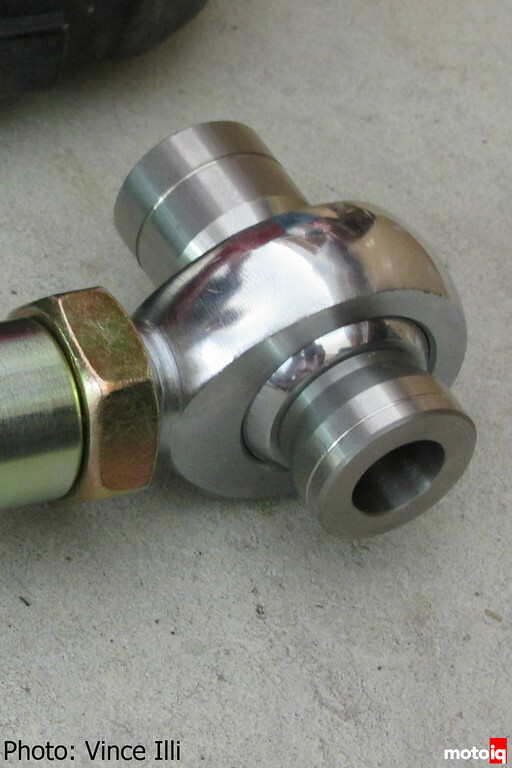 Many combination street/race applications use polyurethane bushings, as they are a very good compromise of performance, comfort, and ease of maintenance. The ultimate solution from a performance perspective is the use of spherical bearings or Heim joints. Discovered by the British in World War II from a captured German fighter plane, Heim joints allow articulation with zero compression. Heim joints are the best of both worlds in terms of performance: in one direction, you can have zero compression and in another you can have articulation. The problem with Heim joints is that they are very noisy and uncomfortable—every bump and vibration is transmitted directly through them, since there is zero compliance to act as an isolator. This Heim joint from BMR allows articulation with zero slop. AEM Introduces 310lph E85-Compatible High Flow In-Tank Fuel Pump for EVO X, WRX STi, R35 GT-R, FR-S/BR-Z and more! Building the Ultimate Turbo Small Block Chevy Part 2, The Making of 1100 Hp!